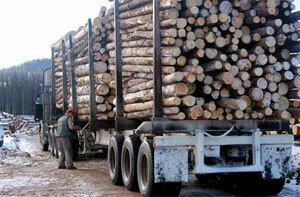 In the last three or four years, logging equipment across Canada has proven that it can truly go the distance. Faced with an unprecedented downturn in the forest industry—and with their sawmill customers seeing lumber markets dry up—logging contractors hung on their equipment. And from feller bunchers to skidders to loaders, it delivered for them, and then some. Just ask Vic Gagnon and Darin Eliason, partners in Quesnel Bros. Logging, of Savona, B.C. 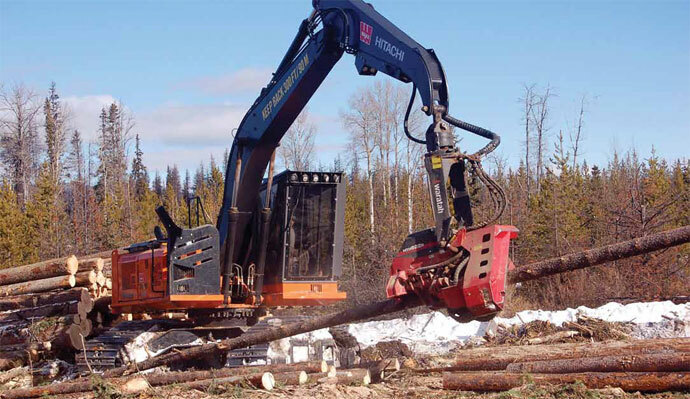 “Logging equipment tends to be fairly reliable these days,” says Gagnon. Which is a good thing, especially the last couple of years. 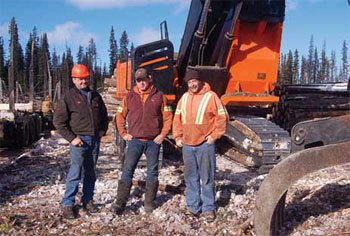 Vic Gagnon (above, right) and Darin Eliason (centre) are partners in Quesnel Bros. Logging, of Savona, B.C. 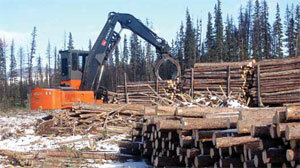 and have recently been adding to their logging equipment line-up. The most recent additions came last fall with two Hitachi ZX 210 F-3 processors and a ZX 240 F-3 log loader. With Gagnon and Eliason is equipment operator Len File. “Like a lot of people in the industry the last couple of years, we were surviving—and that was it,” says Gagnon. 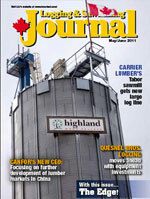 “We couldn’t buy any new logging equipment because things in the industry were so unsure. We wanted to upgrade our equipment, but there was no way that was possible. “We ended up doing a lot of our own repairs, everything was cut to the bare bone,” he added. But things have slowly started turning around for the industry. Lumber prices are up thanks to increased demand for Canadian wood in China. And the U.S. housing construction market is very slowly showing signs of getting off life support. A quick look at their current equipment line-up shows that Hitachi equipment, Hitachi dealer Wajax Equipment and Wajax salesperson Bob Long have all been taking good care of Quesnel Bros. They have a Hitachi EX 270-1 log loader, an EX 270-5 log loader, three ZX 200 processors, one ZX 210 F-3 processor, a ZX 240 F-3 log loader and a ZX 200 excavator. The outfit has a long history with Hitachi, and Waratah processing heads. The operation had the very first ZX 200 log loaders out of the factory and one of the very first Waratah 622B processing heads. In addition to the Hitachi equipment, they have a Cat D-7 H dozer, and out in the bush, they have two Tigercat 870 feller bunchers and three John Deere G-III 748 skidders. Gagnon and Eliason have seen a lot of change since they started out in the industry in the early1980s. They originally worked as separate sub-contractors to Quesnel Bros. Gagnon was doing loader work and Eliason was working a feller buncher. But changes were in the air, when Dave Quesnel, the son of Armand Quesnel, the founder of the company, decided to retire. Gagnon and Eliason bought the company in 2000. “I’d been logging since I was sixteen—I’ve been in the bush since about 1980, and worked for Armie and his son for a long time,” says Gagnon. In 2006, Al Bolster of Bolster Enterprises decided to retire and they had an opportunity to become larger by buying him out. In the meantime, they traded in their stroke delimber for their first processor. With the exception of the downturn years, they have been adding to their fleet ever since. The most recent additions came last fall with two Hitachi ZX 210 F-3 processors and a ZX 240 F-3 log loader. As the two men have taken over logging operations, they have also taken over the equipment of those operations, some of which was a good fit, and some, well … less than a good fit. That said, some of that equipment came in handy, when they were running two shows for the first couple of years. Quesnel Bros was recently working in a block with about 85 per cent mountain pine beetle killed wood, with the balance in spruce. But other areas they log have 100 per cent beetle killed wood. As noted, they have regularly added new equipment to the mix, building on the foundation of the late model, established equipment base—a base that still works quite well, they say. They are generally working with smaller piece size timber, or at least a fair number of smaller pieces, at where they are logging, in B.C. southern Interior, north of Kamloops. This particular block has about 85 per cent mountain pine beetle killed wood, with the balance in spruce. But other areas they log have 100 per cent beetle-killed wood. In the latter areas, it’s not red attack wood any more—it’s more that dull grey that is sadly so familiar through much of the B.C. Interior, meaning that it’s all dead timber. “There is one advantage to that,” says Gagnon. “The needles on the trees are gone, and it lowers the fire hazard.” And with the timber itself, the wood has deteriorated, but you can usually still get a decent sawlog out of it. Quite often they are logging in a dry belt area, and the wood grain is tighter, and the timber seems to hold together better. “In the wet belt areas, the grain is different and the wood won’t last as long, it will come apart once it gets into the mill yard,” explains Gagnon. This year, Gagnon and Eliason expect they will harvest about 290,000 cubic metres. But because of the impact of the beetle, it’s hard to say what the future might hold. “We may end up switching species once the pine is done, and get into the spruce stands and the fir.” If that happens, that might mean a move to larger equipment, to handle the larger wood. When Gagnon and Eliason bought out the Quesnel Bros. operation, what had been separate—equipment, people, and yes, even the challenges—all of a sudden were now shared between the two men. “We amalgamated everything when we moved to bigger operations,” says Gagnon. If there are major repairs, the equipment goes to the shop in Kamloops, about 45 minutes away. Now that Quesnel Bros is also doing roadwork, Gagnon does the roadwork and Eliason does the brush piling. They listen and respect what each other’s recommendations are for what is needed for their respective areas of the operation. “We both know what works best for the separate operations. It all works out,” says Gagnon.